The Labour Court is to make recommendations on cost-cutting measures that saw Dublin Bus staff strike for three days earlier this week. THE LABOUR COURT is to present proposals aimed at breaking the impasse at Dublin Bus later today after unions and management at the company wrapped up talks at 5am this morning. The 15-hour talks were aimed at ending the industrial dispute which saw Dublin Bus staff strike for three days earlier this week. The dispute centres on a proposed €11.7 million in cuts that are being sought at the company. 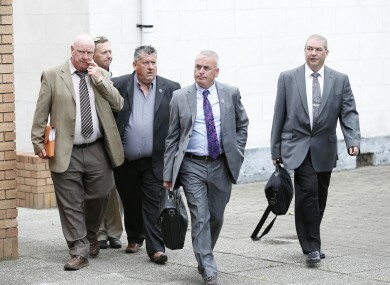 Members of both SIPTU and the National Bus and Rail Union (NBRU), as well as three other unions representing staff, will be balloted on the Labour Court proposals, but SIPTU organiser Willie Noone said that the talks would be “difficult”, warning that there needed to be “movement” on cost-cutting plans. Unions have already rejected a Labour Court recommendation on the cuts, which the court claimed were “plainly and unambiguously necessary” to protect jobs at the company. The three-day strike was the second strike in recent months to hit CIE companies, after a two-day strike at Bus Eireann. CIE is attempting to restructure the finances of all of its companies in the face of falling State subvention and passenger numbers. Irish Rail management has proposed pay-cuts which have been opposed by staff. Those measures will go to the Labour Court in the coming weeks. Email “Dublin Bus staff to be balloted after all-night talks”. Feedback on “Dublin Bus staff to be balloted after all-night talks”.